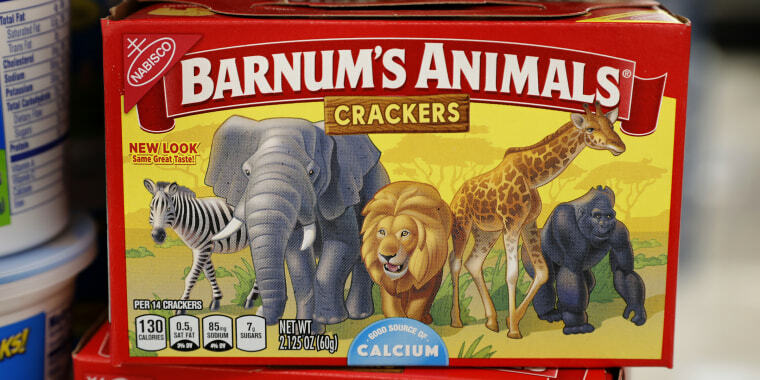 Nabisco's parent company redesigned Barnum's Animals Crackers boxes to show the animals roaming free — and not in cages — after pressure from PETA. These cookie critters are tasting freedom. After spending 116 years behind bars, the majestic beasts on boxes of Nabisco Barnum’s Animals Crackers are no longer being depicted in lock-up. Nabisco’s parent company, Mondelez International, redesigned the snack's packaging in response to pressure by People for the Ethical Treatment of Animals. PETA, which has denounced using animals in circuses, wrote a letter to Mondelez in the spring of 2016 calling for a redesign, according to AP. Mondelez agreed and started working on a makeover. Rebooted cookie boxes, which declare “new look, same great taste,” are on U.S. store shelves now. The new boxes have the same lettering and color scheme, but a zebra, elephant, lion, giraffe and gorilla wander side-by-side outside, instead of being confined in circus boxcars. Canadian boxes already had a different design and were not affected. Mondelez is based in Illinois, which passed a statewide ban on circuses with elephants that went into effect in January, reported AP. More than 80 U.S. cities have fully or partially banned circuses with wild animals, according to Animal Defenders International. Last May, Ringling Bros. and Barnum and Bailey Circus, which the crackers are named after, folded its big tent after a 146 year run due to slack sales. PETA Executive Vice President Tracy Reiman hailed the packaging redo as sign of a cultural shift.